"Back problems - gone. Loving my new Pacific Mattress." "This mattress ... I never want to get up! Still can't believe it came in that tiny little box and just fluffed up right in front of my eyes. Magic." "The dream of a house in Maine is coming true." 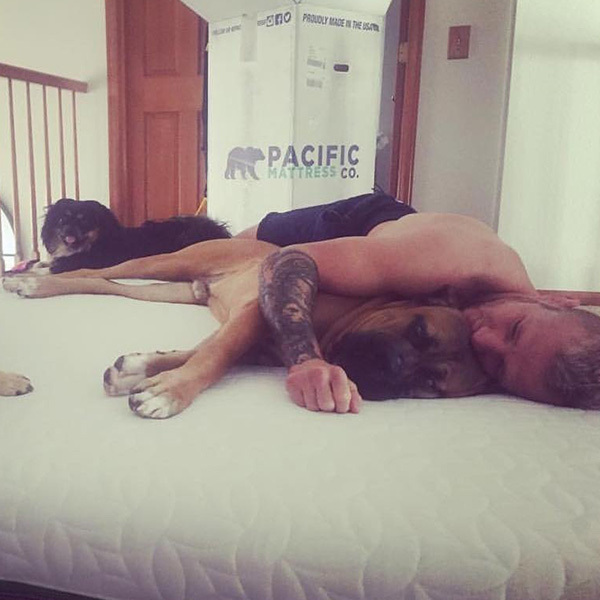 "Crazy this giant comfortable mattress was rolled up in this tiny box and delivered on my front porch, just in time for a lazy Sunday with my pups." "You guys!!! I HAVE TO tell y'll about this amazing new mattress I got for the boys room! It is seriously like sleeping on a cloud! Would it be terrible if I admitted to "accidently" falling asleep in their beds after reading them a story for bedtime? Pacific Mattress Co. knows what's up." "Super emocionado!!! I love my new mattress dude!! Love it." I just purchased a mattress from this company and it has been the best bed, it is very comfortable. I used to have low back pain but since I bought this new mattress I have not had any back pain since. You will not go wrong with these matresses. Best bed out there, you will not be disappointed. LOVE, love, love my mattress! Just got the CalKing, Spencer was so helpful, I love the customer service, my delivery was seamless and I did NOT want to get out of bed this morning. Bonus, I didn't get woken up by my fur baby jumping on and off the bed last night, a huge plus that I wasn't anticipating. Definitely get your next mattress from this company! Thanks for making it a bit more pleasant out here, Pacific Mattress Co! Happy 4th of July to everyone back there in the States! Honestly, I am shocked at how much I like the mattress. The first night I slept on it felt awesome. I laid down, I was out cold, and I woke up feeling great. No neck or back pain. For me, it's the perfect amount of give/cushioning without being excessively soft. Straight up--not understaning getting a mattress in the mail--I had thought I was going to get something that would be good enough to make my time a tiny bit better, at best. As it turns out, I think I may have the best mattress I've ever slept on. I had purchased the Simmons Beauty Rest Black mattresses and it was terrible, my back was constantly in pain, never a restful night. So I started investigating other mattresses and heard about Pacific Mattress Co from a friend, and after a lot of research about their competitors, it sounded like these guys were legit. I order the medium firm and I haven't had a bad night sleep or back pain since it arrived (June '17). I would highly recommend this mattress to anyone with back pain. We got our mattress back in September and in the last six months I have gotten fantastic sleep. I sleep on my back and find that I am supported by the firm mattress, but also very comfortable. My significant other would frequently wake up with his back aching on his old mattress, but hasn’t had this issue at all since we got the Pacific Co mattress. Highly recommend!! I set up my king Pacific mattress and left the room only to return to find my husband asleep and I hadn't put the sheets on yet! I hope my daughter can reclaim her bedroom when she gets back! Great product, well made. Best mattress I ever had. This mattress provides the perfect support and comfort to my entire body -- regardless of sleep position -- from head to toes. You all have turned this bed-in-a-box sceptic into a true believer. Love Love Love our new mattress. It is the perfect firmness and I really love that it comes with it's own mattress cover. Sleeping like a baby and I we couldn't be happier! Several of my friends got the "C" mattress, but for me it was meh. Did a little research-ok a lot of research!-and found Pacific on Sleep Sherpa. Now my friends are jealous and I'm sleeping better than ever. This is the BEST mattress! Thank you! 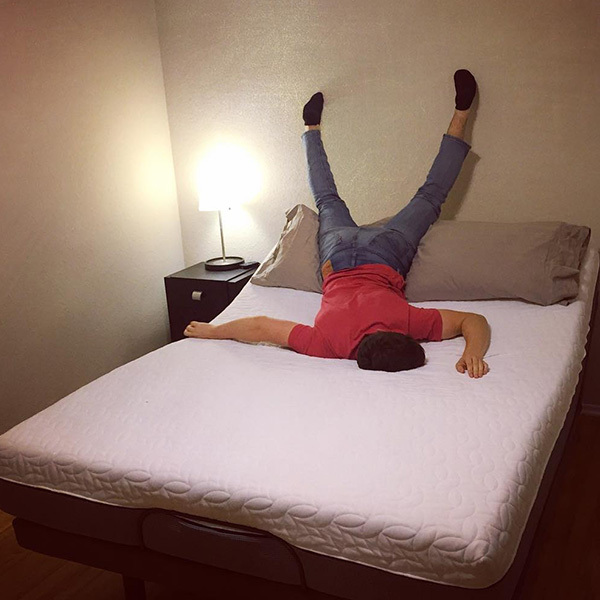 I've slept on a lot of mattresses in my long life, many touting their unique sleep systems, but THIS mattress, with its floating foam design DOES give the best night's sleep. I move a lot as I sleep and no mather the position my body seems aligned and rested when I get up the next morning. Amazing that it came in a box so pressure packed that. with a friends help, I was able to set it up in 20 mins. Best: American made and free shipping! Highly recommend!!!! OMG, I wish this mattress was around 5 yrs ago when I had my accident. The past few months have completely changed my sleep for the better. The stiffness and pain I used to have every morning are GONE! Thank you Pacific Mattress! I slept on a Pacific Mattress at my brother's house in Texas and loved it! I had to know where he bought it because it was going to be my go-to mattress! My 16 year old son was in need of a new bed and I knew a Pacific Mattress was the choice for us. We ordered online and the mattress shipped within a few days and arrived in four days. And we live in Alaska! The process was so easy. My son loves his Pacific Mattress! After his first night's sleep he said - I want to skip school today so I can lay in my bed all day! Whenever we have a mattress to replace, we'll be purchasing a Pacific Mattress! We bought a Pacific Mattress for my parents' guest bedroom because the old one was terrible and we were getting tired of sleeping on it while visiting them. Our Pacific Mattress came on time, was easy to set up and sleeps like a dream! (Ha). I have recommended the product to multiple friends and co-workers too and all have all loved it. I was intimidated by trying a mattress in a box, but I was pleasantly surprised by the quality and how well I sleep. Now I recommend it to everyone in our subdivision and we're all Pacific Mattress fans. Way better than the old mattress. Sleeping like a baby. I was in a bad car accident about six months ago! My back and shoulders were in bad enough shape to the point ware I had to work with a physical therapist. She suggested the Medium firm Pacific mattress. After about two weeks of sleeping on it a can now sneeze and cough with no pain. Never thought a mattress good help me heal! then again, Ive never been in a bad car accident either. THANK YOU THANK YOU THANK YOU! My cousin has scoliosis. I'm going to her about you guys. This mattress treats me like an Angel. Got the softer one and its not soft but has just the right amount of sink and SO supportive. One of my favorite things! And it is so GOOD to get after it! My boyfriend has a memory foam and that ain't happinin. Definitely recommend. After a lifetime of sports and more than 20 years of martial arts, I struggle with almost constant aches and pains in my back and joints which keep deep and restful sleep at bay. Most nights I wake up with back spasms and many mattresses have only exacerbated them. Coil mattresses move every time my partner gets up to use the bathroom and temperpedic foam sleeps too hot, not to mention the cost. Pacific Mattress's soft / medium has the perfect amount of give and support and its foam doesn't bounce at all if the cat jumps on the bed. I've had my best sleep in years since receiving this mattress. I'd highly recommend it to anyone looking for an excellent night's sleep. Got the Casper. Got the Leesa. Both didn't work for me at all so I decided to finally go into a mattress store near me and wouldn't you know it I found another online mattress! The guys there were great and explained why this mattress feels so firm and supportive, but still relieves my pressure so darn good. Now I FLOAT off to dreams every night smiling ear to ear! Thank you!! My friend got one of these and said he never slept so good. So naturally I have to do what my friends do. Heard about these shrunk up mattreses but was still mind blown when this sucker popped up! Never seen anything like it. And o by the way I've never slept so damn good! Telling my brother to get one right now! This Float stuff they got going on is crazy. Like sleeping on a supportive cloud. Medium Soft is the s**t!! I honestly have never immediately loved a mattress as much as my mattress from Pacific Mattress Co. Not only is it super soft but I can't feel anything when someone else moves while on the mattress. And I don't wake up with any back pain even though I chose the softest option. I would highly recommend this mattress to anyone I know and will be buying more for my home. Whoa! Been sleeping on the medium soft for a few of months now and it is changing my life! I wasn't sure I would like it for the first couple weeks, but once I got used to it it is AMAZING!!! I'm waking up so rested i almost jump out of bed. I used to be cranky and groggy till I got my coffee fix, but now I almost don't need it-except I love my coffee!! Even New Year's morning felt fantastic! THanks Pacific Mattress for sending me such a surprise in a box! Happy New year to me! This mattress is amazing! I have been sleeping like a baby ever since it came in. Great company to work with also. Fantastic customer service. When I ordered I couldn't wait for my new mattress to come in, and luckily my mattress was shipped quickly! The best bed I've ever slept on! I've had my Pacific Medium Soft now for a little over 2 months. My girlfriend and I go back and forth between her memory foam bed and mine. When we really need a good night sleep, we always come back to my place, to sleep on this bed. We can easily close our eyes, completely pass out, and then wake up reborn each morning. This bed has been an incredible investment in my health. I have been rehabilitating, post hip surgery, and I get no aches and pains with this bed! I recommend this bed for everyone! Superb comfort. Best mattress ever! Did not know what I was missing sleeping on an Ikea mattress for the past 7 years. Such a game changer to my whole life not fighting to get out of bed every single morning. My boyfriend insisted we get this mattress. I didn’t really care as I thought our previous mattress was fine. Boy was I wrong! All the aches and pains that I attributed to sleeping position, working out, etc. are gone. I now notice the difference every time I sleep in a hotel and am convinced the average person accepts a lesser level of sleeping comfort because they don’t know any better. This is a fantastic mattress set up with minimal invasiveness (no store trips, no “mattress movers arriving between 12 and 4PM”, etc), its a great deal and made here in CA!!! We are parents of 3 and are on the go from sun up until who knows when! We were in dyer need of a new mattress and found exactly what we were looking for in Pacific Mattress Co. From ordering all the way until the first night we were able to sleep on our new mattress we had an incredible experience. Everyone we spoke with and assisted us was fantastic. A GREAT company to work with and even better products! Thank you Pacific Mattress Co for helping us get the rest we need to keep up with three little ones! Anyways…it’s super comfy, we’ve had it 2 weeks and I left the bedroom door open and the dog pee’d on it…luckily I was able to take off the cover and throw it in the wash, super easy to take the cover off and put back on, then Bissel’d the mattress part and it’s good as new. I say give it a whirl. I’m a doctor of physical therapy, and have been recommending this product to my clients that have trouble sleeping or waking up with back or hip pain. Back problems - gone. Loving my new Pacific Mattress. The Medium Soft mattress has revolutionized my sleep. I can sleep in weird positions and I don’t wake up with kinks or knots in my shoulders/back. I fall asleep easily now because of how comfortable I am. I eat, sleep, and work on my mattress because it’s just so relaxing. It’s the perfect balance of soft and firm. I get the support I desperately need for my shoulders/neck and back and I also get the cushion. I’ve placed it on the floor and it feels just as great as when I tried it in the store. I’ve talked about this mattress to everyone I know nonstop. I’ve never loved sleep so much before. I even wake up late sometimes because I’d rather sleep in blissfully and rush later. I have owned this mattress for about a month now and I can’t say enough good things about it. First, I was having consistent lower back pain for 6 months before this mattress. Within the first week of sleeping on my new Pacific Mattress all of my pain was gone. Secondly, me and my partner are serious athletes that prioritize our sleep above nearly anything else. Both of us have noticed an easier time falling asleep, a much deeper sleep, and better energy levels throughout the day. 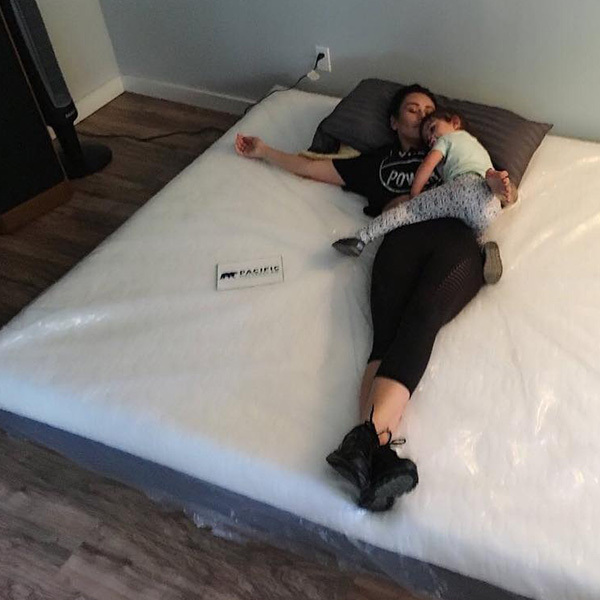 I have also slept on foam mattress before that felt like the were warmer than a traditional spring mattress, I can say that this Pacific Mattress sleeps nice and cool even as we are going into the summer months. Overall Pacific Mattress CO makes a great product at a great price. Ordering was super easy online, delivery was prompt, and setting up was a piece of cake. I recently ordered the medium firm and I have to say it really is the best firm type of mattress you can ever buy! A very nice gift from my brother! There is seriously something magical about how this mattress works. The technology used in the material is what makes this bed truly fascinating. I don’t even feel the annoying humidity or heat that I used to feel with the other standard mattresses. The Pacific Mattress Co. bed felt adjusting to my body temperature during my sleep and I didn’t wake up. This is also what mainly makes this mattress very efficient as well. Very clean too. This bed is excellent for maintaining good posture. My neck was cramping a little bit before but after sleeping on this I felt much better! My neck even felt more straight! I didn’t want to wake up in the morning after sleeping on it, it just felt soooo good!! When I woke up I felt fresh and ready to go start the day as I got up from the bed. I nicknamed this the new and best “luxury mattress”. Trust me, it is really worth buying!! I am saying as an experienced customer. This mattress has the perfect balance and combines all the elements needed in a good mattress. I will recommend this to everybody!!! This mattress is amazing! It was a great gift from my son on mother’s day! I slept like a baby. My daughter even said laying on it felt like a whimsical wonderland. No other mattress can compare to the amazing quality of Pacific Mattress Co. Once you sleep on it, you’ll fall in love with it! I woke up feeling all fresh and ready to start my day. This mattress somehow has a special mind relaxing effect as you lay on it. Its comfy with lots of support. Economical to use as well. Awesome technology. Pacific Mattress Co. beds have beaten even the pricey luxury mattresses. I would call Pacific Mattress Co. beds the new form of luxury mattress!! I will recommend this to everyone who is looking for quality with comfort. I’ve had my new mattress for just over 2 weeks now and I couldn’t be happier with it. The ordering process and delivery were very easy and hassle free. More importantly, the mattress is unbelievably comfortable and has improved my energy throughout the day. It has been easier to wake up and I feel better at work. Thanks guys from Pacific mattress Co, I definitely recommend their mattress to anyone who doesn’t have one! Thanks, Robin and Pacific Mattress Co! 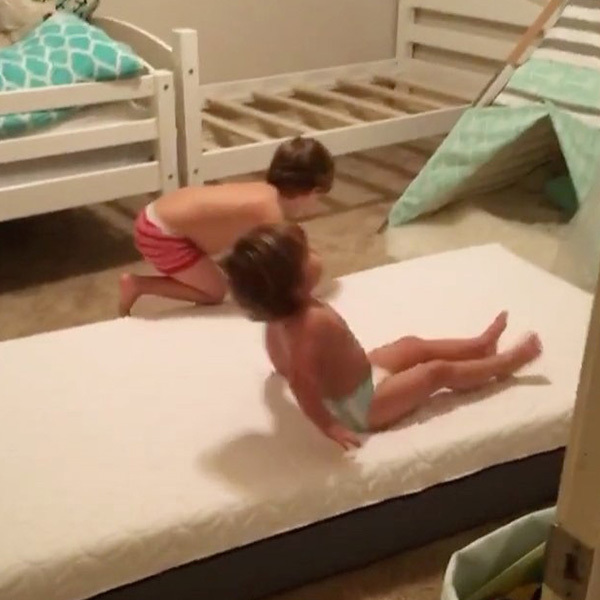 We received our new Pacific mattress and we’re already fighting over it! We love this mattress!!! We ordered the medium soft mattress and it’s totally and completely comfortable. Its soft AND supportive all at the same time; I don’t think I’ve ever felt anything like it. I was so amazed that I ran around the house lying in all of our existing beds to see if anything was even in the comfort ballpark with the Pacific Float Foam mattress; we have 4 other beds including a newer Temperpedic (which suddenly feels like a brick to me) and NONE of them were even close to as comfortable! Opening the mattress and watching it expand was fun. The mattress was fully expanded and ready in less than a minute! Thank you so much! We’re going to have to order some more of these! I purchased the medium firm queen mattress 3 weeks ago. I was introduced to the product through a random encounter with one of the founders, Spencer. In the standard “so what do you do?” conversation we had, his passion and confidence in his creation was left an impression on me….and I just happened to be in the market for a mattress…..coincidence? So far my experience has been stellar. I have a platform bed with slats and need for a boxspring. This mattress fit the criteria being that no boxspring is needed. The “float foam” name describes how you feel when laying on the mattress….a floating sensation. I’ve had no problems with heat retention that is said to be an issue with some foam mattresses. Motion transfer is undetectable when getting in and out of bed. It had all the features and comfort I was looking for but for less than what I expected to pay. I’m grateful for that random encounter. I was in need and the Universe provided, no coincidence here. Great product and I would recommend this mattress to anyone that sleeps. Thank you for your great service, Spencer. I am a gym owner and strength and conditioning coach in Austin Texas and I share with all of my clients the importance of a good night’s rest, and additionally the importance of back health and posture. Spinal column health is of premier importance to human movement and a great mattress dramatically improves overall spinal health. The Pacific Mattress co. Medium Soft mattress has precisely the right amount of soft, with the rigidity needed to maintain great spinal alignment either on your back, side, or stomach. This bed is highly recommended for fitness minded people, and for the average joe. Overall I am extremely pleased with the investment I made in my health with Pacific Mattress co. I ordered the medium-firm mattress – I love it! I received the mattress last month and wanted to give it a bit of time before writing my review, just in case my sleep quality changed. I first tested this mattress out at the Sweet Dreamzzz Mattress Store while visiting California, where I was killing time waiting for family to show up at a nearby restaurant. I’d been looking for a quality mattress at a reasonable price and had heard about the Pacific Mattress Company – their innovative mattresses, ability to ship to Florida and super generous return policy if I discovered the mattress wasn’t for me. I couldn’t wait to receive it. The mattress arrived on the date promised and although my husband was home, I decided to set it up myself – which was easily accomplished in less than 10 minutes. (Advice – place the wrapped mattresses onto the box spring before unwrapping!) The mattress is extremely comfortable, provides great back support and sleeps “cool” – which is a great relief from many of the otherwise comfortables mattresses I have tried on my business travels. I definitely recommend this mattress for an excellent night’s sleep!